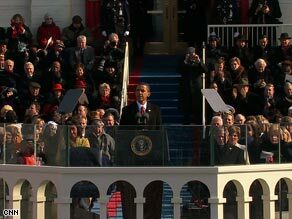 WASHINGTON (CNN) -- President Barack Obama invoked a spirit of confidence and renewal Tuesday, proclaiming to hundreds of thousands of people on the National Mall that the country would ultimately thrive despite hard economic times. The new president pledged both "bold, swift action" and a willingness to make tough choices in the name of economic recovery and eventual victory in the global war on terror. "Today I say to you that the challenges we face are real," Obama said. "They are serious, and they are many. They will not be met easily or in a short span of time. But know this, America -- they will be met." He thanked President Bush for his service and stated that "the question we ask today is not whether our government is too big or too small, but whether it works -- whether it helps families find jobs at a decent wage, care they can afford, a retirement that is dignified." He also pledged an eventual return to fiscal responsibility. "Where the answer is yes, we intend to move forward. Where the answer is no, programs will end," Obama said. "And those of us who manage the public's dollars will be held to account -- to spend wisely, reform bad habits and do our business in the light of day -- because only then can we restore the vital trust between a people and their government." At the same time, the president renewed his call for a massive plan to stimulate economic growth and dismissed critics who question its price tag. "Everywhere we look, there is work to be done," Obama said. "The state of the economy calls for action, bold and swift, and we will act -- not only to create new jobs but to lay a new foundation for growth. ... All this we can do. And all this we will do. "Now, there are some who question the scale of our ambitions -- who suggest that our system cannot tolerate too many big plans. Their memories are short," Obama proclaimed. "For they have forgotten what this country has already done, what free men and women can achieve when imagination is joined to common purpose and necessity to courage." While embracing the political middle ground and largely looking forward, Obama noted that the economic crisis was "a consequence of greed and irresponsibility on the part of some, but also our collective failure to make hard choices and prepare the nation for a new age." "We will begin to responsibly leave Iraq to its people, and forge a hard-earned peace in Afghanistan," Obama proclaimed in his inaugural address. "Our nation is at war, against a far-reaching network of violence and hatred," Obama said. But with "old friends and former foes, we will work tirelessly to lessen the nuclear threat and roll back the specter of a warming planet. We will not apologize for our way of life ... and for those who seek to advance their aims by inducing terror and slaughtering innocents, we say to you now that our spirit is stronger and cannot be broken; you cannot outlast us, and we will defeat you." Obama, the nation's first African-American president, also invoked the spirit of the civil rights movement, noting that, in previous generations, his own father might have been denied service at a restaurant. "This is the meaning of [America's] liberty and our creed: why men and women and children of every race and every faith can join in celebration across this magnificent Mall and why a man whose father less than 60 years ago might not have been served at a local restaurant can now stand before you to take a most sacred oath," the president noted. "So let us mark this day with remembrance, of who we are and how far we have traveled," he said.